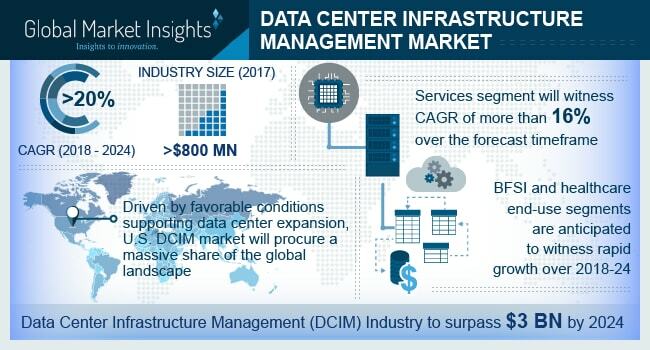 Data Center Infrastructure Management (DCIM) Market size is set to exceed USD 3 billion by 2024; according to a new research report by Global Market Insights, Inc. The high penetration of the DCIM market is strongly aided by the increase in environmental and data security regulations put forth by governments of various economies to lower the power consumption through conventional sources and reduce the overall detrimental effect on the environment. Data centers consume large amounts of electricity and are required to be constantly cooled to work effectively without developing any faults. The National Resources Defense Council (NRDC) noted that by 2020, the data center power consumption is projected to increase to approximately 140 billion kilowatt-hours annually. The data center infrastructure management (DCIM) market technology is highly beneficial in tracking consumption, mitigating companies’ carbon footprints and identifying locations of higher usage and power leakages. Additionally, these software solutions and services also aid in managing the various facilities infrastructure and are designed to accommodate future changes in the infrastructure.